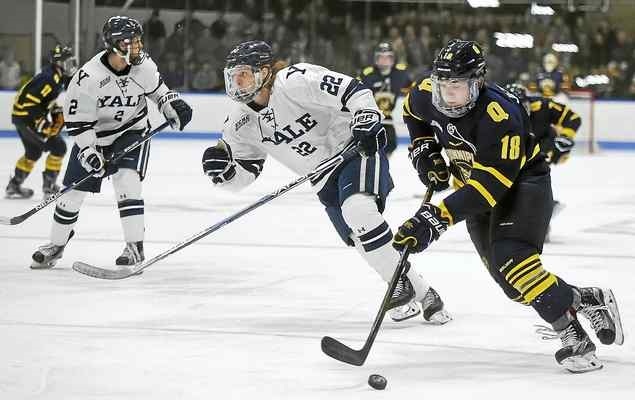 The Quinnipiac Bobcats men's ice hockey team ended its regular season on a high note Saturday with a 4-1 win over the Brown Bears on senior night. It is the first three game winning streak for the Bobcats since winning four in a row in mid-November. Quinnipiac has won five out of its last seven games to finish the regular season 19-13-2 and the 5th seed in the ECAC playoffs where they will face these same Brown Bears for a first round series next week in Hamden. Prior to the game, six seniors were honored for their contributions to the men's ice hockey program over the last four seasons which included Connor and Tim Clifton, Derek Smith, Tommy Schutt, K.J. Tiefenwerth and Joe Fiala. This senior class still has a very solid chance at finishing with over 100 wins for their career as they currently sit at 98. The two teams were scoreless for the majority of the first period before freshman Nick Jermain scored a highlight reel goal on Gavin Nieto giving the Bobcats the lead. Jermain made impressive moves around both the Brown defender and Nieto for his first goal at home this year. Kārlis Čukste and Kevin Duane picked up the assists on the goal. 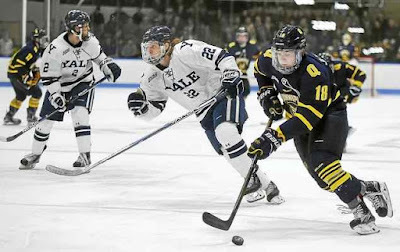 Not even a minute later, New Canaan, Connecticut product Charlie Corcoran scored his 15th goal of the season to even the score going into the first intermission. Just fifty five seconds into the second period Tanner MacMaster potted his seventh goal of the season on assists from Bo Pieper and Landon. Quinnipiac picked up two more goals both from underclassmen when just a minute after the MacMaster goal it was Thomas Aldworth getting his seventh of the season from Jermain and Duane. Freshman Alex Whelan finished the Quinnipiac scoring for the night with a beauty of a goal high past Nieto. Čukste and Tiefenwerth picked up the assists. Quinnipiac out shot Brown 37-19 for the game while freshman goaltender Andrew Shortridge was solid in net again with 19 saves for his ninth win of the season. These two teams will meet again next Friday at 7 p.m. at the High Point Solutions Arena. Game two will be Saturday at 7 p.m. and if necessary, game three will be Sunday at 4 p.m. Quinnipiac has made the ECAC Final Four five times in their history but only one time coming out of the first round of the playoffs back in 2007 when they lost to Clarkson in the championship game.